Zion Market Research has published a new report titled “3D Printing Metals Market by Type (Titanium, Steel, Nickel, Aluminum, and Others), by Form (Powder and Filament), and by End-use (Aerospace & Defense, Automotive, Healthcare, and Others): Global Industry Perspective, Comprehensive Analysis, and Forecast, 2018 - 2024”. 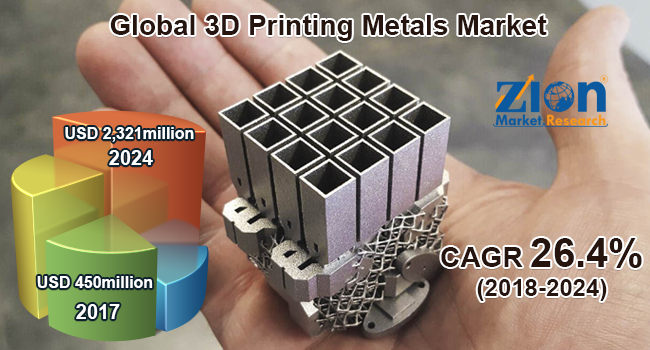 According to the report, global 3D printing metals market as valued at approximately USD 450 million in 2017 and is expected to generate revenue of around USD 2,321 million by the end of 2024, growing at a CAGR of around 26.4% between 2018 and 2024. Asia Pacific region is growing with the highest growth rate in the global 3D printing metals market. The region is anticipated to continue its leading position over the estimated period. The growth of this regional market is attributed to rapid technological advancements. Additionally, the rapidly emerging manufacturing industry coupled with increasing economic development witnessed in emerging nations such as India and China will fuel the growth of the regional market. These factors are anticipated to further drive industry growth in the region over the forecast period. North American region is projected to have a significant revenue share in the global 3D printing metals market. The region is considered developed and diverse. With the presence of big players across the region, most of the research activities and product developments are confined to the region. This will boost the regional market growth. These are the factors which are slated to boost the growth and development of the global 3D printing metals market across the world.